AAP dharna HIGHLIGHTS: The BJP and Congress slammed Arvind Kejriwal, terming his 'dharna' at the L-G office a "mockery of democracy" and a "drama". Get all the latest news here. 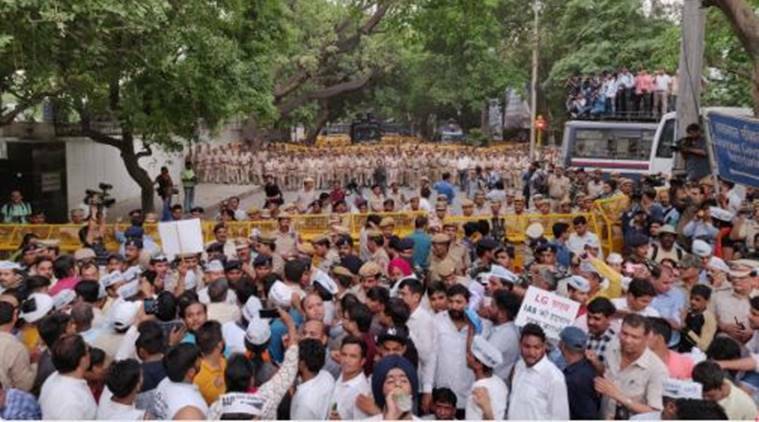 A large number of AAP leaders and workers protested outside LG’s house on Wednesday, even as Delhi Chief Minister Arvind Kejriwal and his cabinet colleagues continued with their sit-in at Anil Baijal’s office for the third straight day. Deputy Chief Minister Manish Sisodia also began an indefinite hunger strike today. Earlier, on Tuesday, Health Minister Satyendar Jain had launched an indefinite hunger strike. 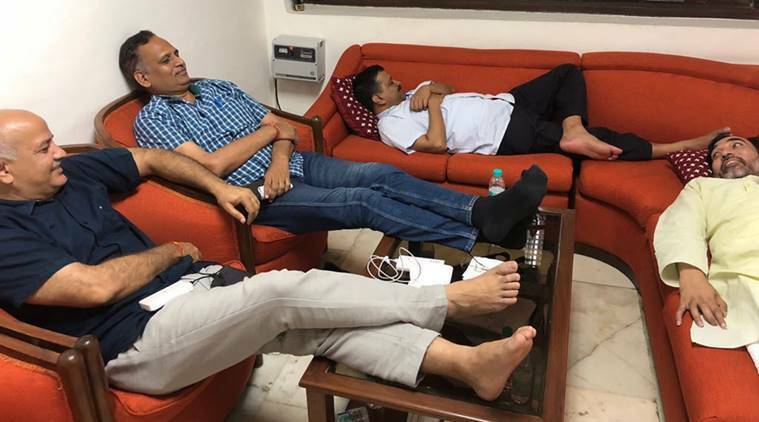 Kejriwal, along with Manish Sisodia, Satyendar Jain and Gopal Rai have been staging a sit-in at the LG’s office since Monday to protest against agitating IAS officials and to get an approval for the doorstep ration delivery scheme. West Bengal Chief Minister Mamata Banerjee also came in support of Delhi Chief Minister today, appealing LG Anil Baijal and Modi government to resolve the issue. “We are not sitting here for ourselves. We are sitting here for the people of Delhi, for schools, water, mohalla clinics, so that the people of Delhi get the facilities,” Kejriwal said in a video message from LG’s office. Meanwhile, the BJP and Congress slammed Kejriwal, terming his ‘dharna’ at the L-G office a “mockery of democracy” and a “drama”. Raising the water shortage issue in the city, BJP’s Delhi unit also staged a protest at Kejriwal’s residence today. He accused Home Minister Rajnath Singh of not taking any initiative to resolve the impasse. The Centre is sleeping. There are no reports to show that Rajnath Singh is taking it seriously. Why hasn't your voice reached the PMO and the Home Ministry?" Sinha expressed solidarity with Kejriwal saying, "If Atal Bihari Vajpayee were there, he would have directed the home minister to talk to the Delhi chief minister to figure out a way." He, has served as a cabinet minister under Prime Minister Atal Bihari Vajpayee, said he had no regrets about not working with the current BJP dispensation. Former Union minister Yashwant Sinha said a prime minister like Atal Bihari Vajpayee would have held talks with Delhi Chief Minister Arvind Kejriwal to end the ongoing impasse between the AAP government and the bureaucracy. Sinha, who joined AAP leaders as they marched to the Lt Governor's office over IAS officers "strike", said he had no regrets about not working with "small-time leaders" (of the BJP). Even as the sit-in by Chief Minister Arvind Kejriwal and three ministers entered its third day, Deputy Chief Minister Manish Sisodia today began an indefinite strike and the AAP vowed to continue its struggle after its leaders and MLAs marched to the L-G office. Congress leader and former Delhi CM ShSheilaixit today said that Arvind Kejriwal is not at all conscious of his constitutional duties due to which people of Delhi are suffering. She lambasted the AAP leader for his sit-in protest inside the Raj Niwas that entered its third day today. Dikshit, a three-time Delhi Chief Minister, said it was "completely unacceptable" that head of the government was sitting on a "dharna" at the Lt Governor's house when the city was reeling under severe water crisis and other problems, reports PTI. Huge support for #March4Democracy !! पूर्व केंद्रीय वित्त मंत्री @YashwantSinha पहुँचे मंच पर! LG हाउस तक मार्च से पहले मुख्यमंत्री आवास पर आम जनता का उमड़ा जनसैलाब! Delhi Assembly Speaker Ram Niwas Goel today supported the demands of Chief Minister Arvind Kejriwal and his ministers staging a sit-in at the L-G office since Monday evening, as he jumped into the ring to attack Lt Governor Anil Baijal over IAS officers' "strike". 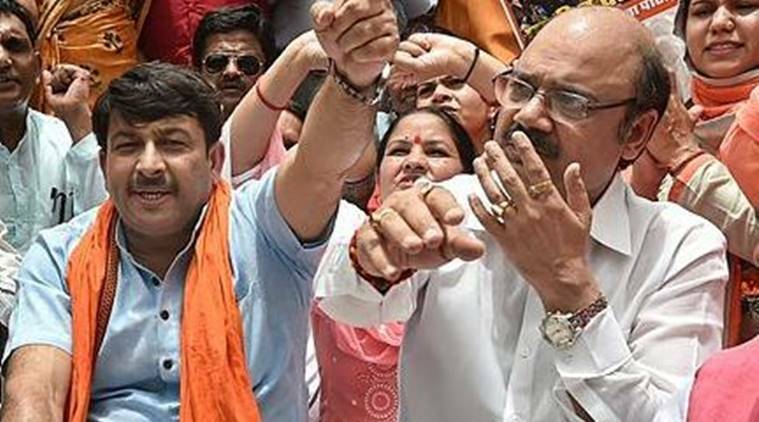 Delhi BJP Chief Manoj Tiwari, party workers protest outside Delhi CM's office over water, power supply. Mimicking the protest by AAP party at LG's office, BJP leaders today sat on a dharna at Delhi CM Arvind Kejriwal's office against the "non-performance" of his government, reports PTI. Rebel AAP legislator Kapil Mishra also staged a protest outside the CM's office. "All this is being willingly done under LG's patronage and on Modi Ji's instructions. Since 2014 -- when the Modi government came to power -- the post of Governors and Lieutenant Governors are being misused, wherever there is opposition in power. But we will not remain silent," says Sanjay Singh. In the wake of AAP's march today evening, security has been heightened outside Raj Niwas. Police personnel and paramilitary has been deployed in a 2 km radius of the LG's office. AAP leaders who are camping outside Kejriwal's residence said that the fight will continue and they will not be "bogged down" till their demands are met. "Modi and LG are not allowing us to work for the betterment. LG is orchestrating the strike by the IAS officers," AAP leader Sanjay Singh said. AAP MLA @Sanjeev_aap's appeal for Citizens of Delhi to join the March to LG House. Today, 4 PM from CM House. Extending his support to CM Kejriwal's demand of complete statehood for Delhi, Kerala Finance Minsiter Thomas Isaac said, "LG rule in Delhi must end." "Union Territories like Delhi , wth legislatures should be given the status of States. LG rule in Delhi must end. It is a shame to Indian democracy that the elected CM and colleagues have to sit in all night dharna at LG office," he wrote on Twitter. * Issue a direction to IAS officers to end their "strike"
* Action against those who have struck work for "four months"
* Approve the proposal for doorstep delivery of rations. While Kejriwal and company continue to protest at the LG's office, Anil Baijal did not come to his office on Tuesday. Sources said Baijal had meetings in the Union Housing and Urban Affairs Ministry and other places, and this was why he could not come to office today. However, the LG made sure that the leaders were provided tea and snacks. Alleging that the IAS officers had been skipping work, the AAP on Tuesday released a set of weekly reports, signed by WCD (director) Shilpa Shinde, to establish that non-cooperation by officials was affecting work. Six reports that stated that there was “nil” progress to be reported from the department were shared by AAP and ministers on Twitter. Shinde sought to set the record straight by releasing another set of documents, which included three reports from the department to show that work was done on other weeks. “The allegation that officers are not meeting ministers is not entirely correct. Meetings have been attended during the preparation of the budget, cabinet decisions, and several other issues,” said a senior officer who did not want to be named. Satyender Jain, Arvind Kejriwal, Manish Shisodia and Gopal Rai at LG House, on protest on June 11, 2018. Express photo. AAP workers on Tuesday gathered at CM Arvind Kejriwal's residence to extend support to their leader. The IAS officers, meanwhile, maintained that terming the agitation as a “strike” was wrong, as they have merely been skipping routine meetings to protest against the alleged assault on Chief Secretary Anshu Prakash at the CM’s residence on February 19. In a counter, Delhi AAP spokesperson Saurabh Bhardwaj, citing rules said, even "slowing down" work and not attending meetings called by ministers was a form of strike.